From the historical perspective, there is no denying that the primary basis for Santa Claus was derived from the figure of St. Nicholas, a 4th-century Christian saint of Greek origin, who was the Bishop of Myra, in Asia Minor (present-day Demre in Turkey). Suffice it to say, like his jolly (though somewhat commercialized) counterpart, St. Nicholas or Nikolaos of Myra was also known for numerous deeds, with many of them being even considered ‘miraculous’. 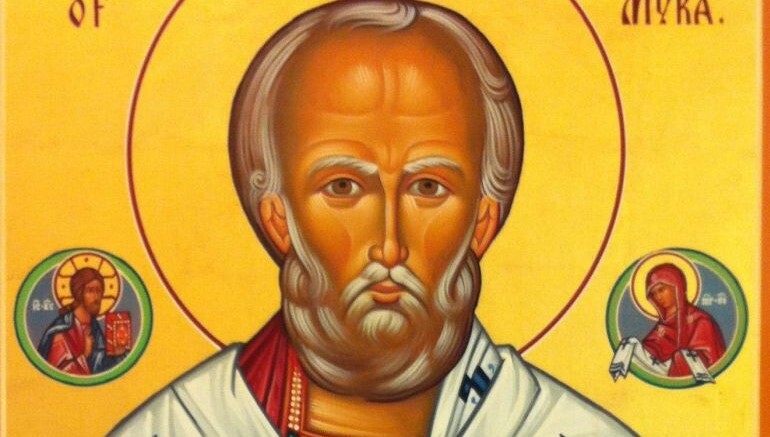 Indeed he was known as Nikolaos the Wonderworker (Νικόλαος ὁ Θαυματουργός), and thus his reputation and legacy was preserved by many an early Christian saint, thus ultimately aiding in the characterization of latter-day Santa. 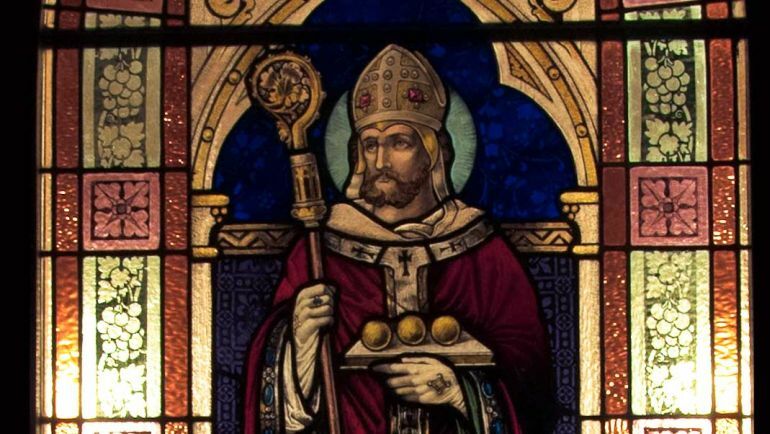 So without further ado, let us take a gander at eight things you probably didn’t know about St. Nicholas. In our contemporary culture, Santa Claus can be arguably identified as a more secular motif when compared to the religious overtones brought on by the imagery of Jesus Christ. But unlike Jesus, St. Nicholas was born into a wealthy family (in 270 AD). Now beyond just his economic designation, it was his access to relatively more wealth that probably set off a ‘motion of good deeds’ – thus ultimately giving rise to the character of Santa Claus as we know him. To that end, St. Nicholas’ family business possibly entailed a large fishing fleet. But from his childhood days, Nicholas displayed piety as opposed to a life of spoiled indulgence. And the turning point to this affable period came when both of his parents apparently died from a plague. But instead of squandering away his rich inheritance, Nicholas began to serve the poor near his home, and finally started traveling in the surrounding towns and countryside. Greek monks traveling from Asia Minor had already established a rudimentary monastery dedicated to St. George on the mountain overlooking Bethlehem, in around 305 AD. And after spending most of his youth in his native land (by serving various charities), Nicholas made his pilgrimage to the Holy land in 312 AD and visited renowned sites like the Holy Sepulcher, Golgotha, and Bethlehem. During this time, he almost became an ascetic by living inside caves near Bethlehem for three years. In fact, he also produced some (now lost) writings in the contemporary period – a small note of which is still preserved in the care of the Greek Orthodox Patriarch of Jerusalem. However, by 315 AD, he traveled back to his homeland in Asia Minor and was subsequently a consecrated bishop by 317 AD. Unlike the other ‘miraculous’ achievements of the St. Nicholas – some of which fantastically involve resurrecting dismembered children and generating magic wheat, one story stands out due to its seemingly realistic nature. This entails the scenario where Nicholas helped a poor man who had three daughters. As was the biased tradition back then, the man couldn’t pay any dowry for his daughters’ marriages – which meant the women had to take other unsavory paths (like prostitution) due to lack of conventional employment opportunities. But St. Nicholas intervened in the matter, by throwing purses filled with gold coins into the man’s house through a window on a yearly basis. He did so in an inconspicuous manner in a bid to hid his own identity – so that the man could be saved from the apparent humiliation of accepting charity. And according to one variant of this story, the man grew overly suspicious before the third (and final) year, and thus kept a watch for the secret benefactor by the window. But St. Nicholas supposedly already knew of this ploy, and hence tossed his bag through the chimney. The bag then fell into one of the stockings left before the fire to dry. And thus sprang the tradition of hanging socks by the chimney’s fireplace. In another incident (which may have its actual historical basis), while Nicholas was busy traveling to a remote part of his diocese, several citizens from his native Myra came to him with an urgent news: the ruler of the city, a man named Eustathius, had condemned three supposedly innocent men to death. On hearing the sentence, Nicholas made a detour for his home in haste. 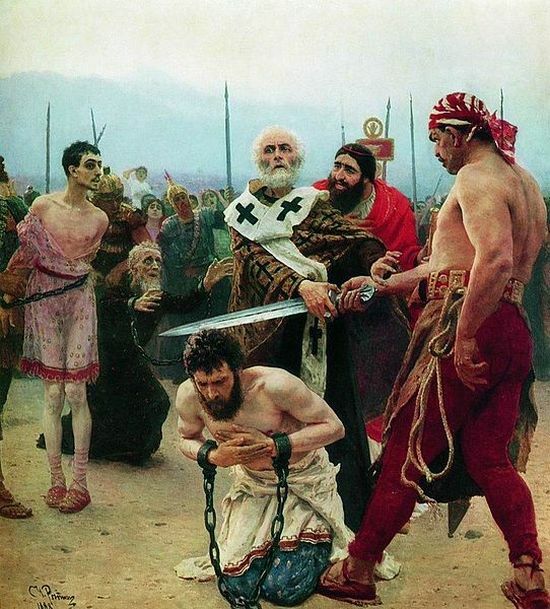 Though taxed by his long journey, the bishop was able to reach the outskirts of the city, and here he learned that the execution was to be carried forth after just a few minutes. Hurriedly he reached the executioner’s field and found a crowd surrounding three men who were meekly kneeling with their arms bound while waiting for the fatal blow. On seeing this, Nicholas rushed forth through the crowd and stayed the executioner’s hands. Then he proudly took the sword, threw it to the ground, and finally ordered that the condemned men be freed from their demeaning bonds. The story then goes on to present how St. Nicholas was considered as an authority figure in spite of not holding an official administrative position. Consequently, the executioner couldn’t even muster the courage to pick up his fallen sword. And after a while, Eustathius also repented his hastily pronounced sentence – thus providing an anecdote on how St. Nicholas was seemingly against death sentence and injustice. 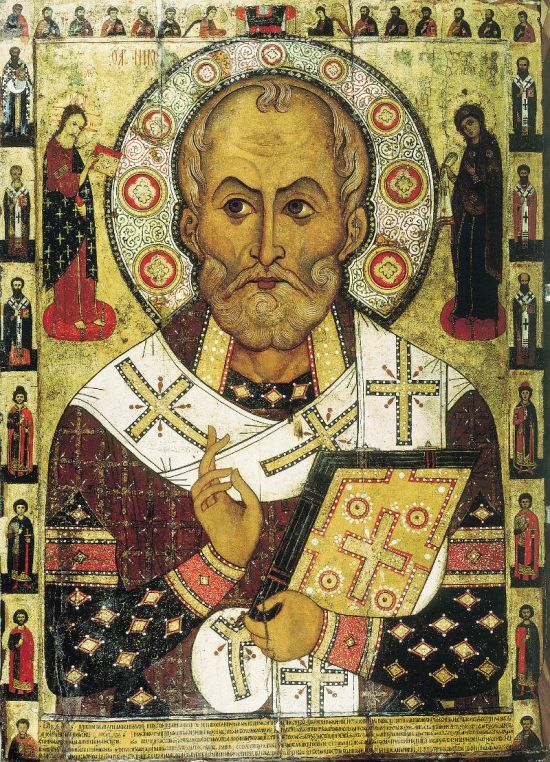 From the historical perspective, given his bishop status, St. Nicholas (along with 318 other bishops) accepted the invitation offered by Eastern Roman emperor Constantine to appear at the First Council of Nicaea, held in the city of Nicaea (now Iznik, Turkey) in 325 AD. Often viewed as the first ecumenical council, the mass gathering was called to attain consensus in the church through a religious assembly representing all (or at least most) of Christendom. One of the major talking points of the council pertained to the so-called Arianism, where presbyter Arius supported the supremacy of God the Father, which basically encompassed the argument that the Father’s divinity was greater than the Son’s. Unfortunately for Arius, such a view was contrary to the generally accepted Eastern Orthodox view of his bishop, St. Alexander of Alexandria. And according to some accounts, Nicholas was so enraged by Arius’ debate during the Council that he went to him and struck the presbyter squarely in the face. Now since we are talking about history, this incident might have been apocryphal, since Arius was probably not physically present in the council – because he was not a bishop. But still, the very presence of St. Nicholas in the council proves how much importance he gave to matters concerning Orthodox Christianity. This can be credibly hypothesized from the numbers game. According to tradition, Constantine called over 1,800 bishops of the Christian church, but only 318 of them arrived. 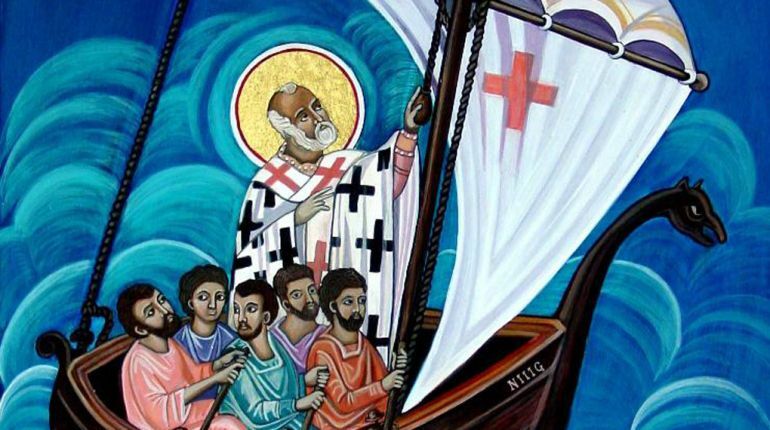 In other words, St. Nicholas was one among the very few eminent personalities who attended the council (since he was part of the paltry 18 percent of Christianity’s bishops in attendance). There was a legend in Myra that each year St. Nicholas’ relics exuded a pristine watery liquid that supposedly had miraculous healing powers. This liquid was called the ‘manna‘. Oddly enough, the relics continued to secrete this mysterious fluid substance even when they were transferred to the city of Bari, in southern Italy. And as such, vials of such manna are still procured from the 11th-century Basilica San Nicola church – by the clergymen on St. Nicholas’ Day (6th December) every year. 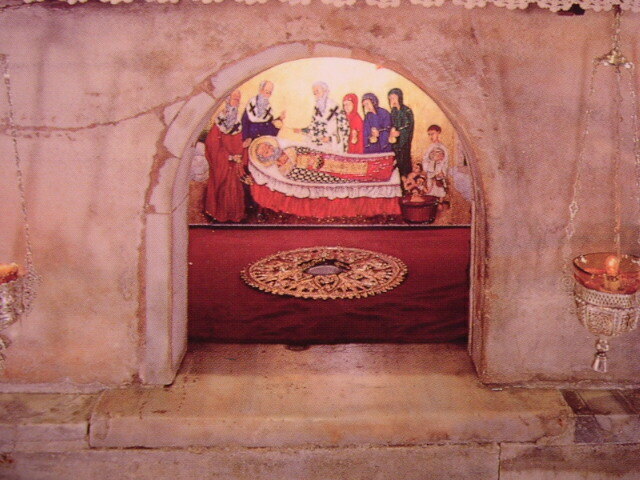 The substance is collected from a sarcophagus which is housed in the church’s vault compartment. As for the scientific perspective, experts are not sure if the manna is secreted by the body remains of St. Nicholas himself or from the marble floor of the space. To that end, one of the theories put forth pertains to how the liquid originates due to the capillary action – which entails the gradual transfer of seawater to the tomb space. There is a probability of such a phenomena occurring due the lower than the sea-level location of the tomb itself. Since we talked about the odd properties of St. Nicholas’ bones, researchers were actually able to study his skull in details from an x-ray photography series and measurements compiled in 1950. 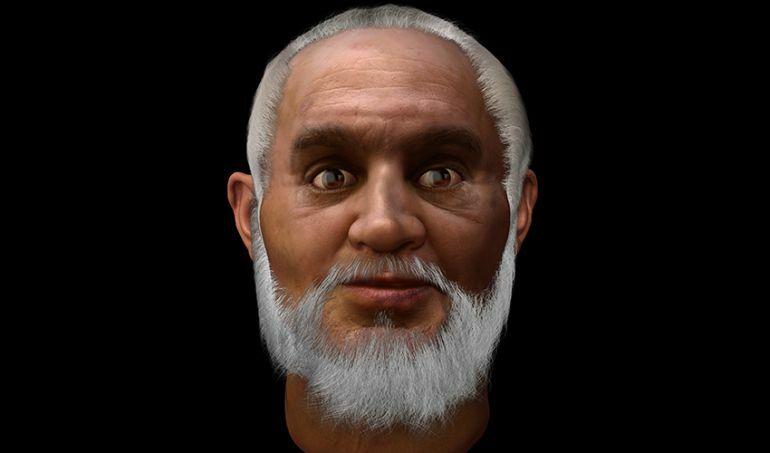 Caroline Wilkinson, a facial anthropologist at the University of Manchester, has utilized these assessed notes and documentations, to forensically reconstruct the facial attributes of the 4th-century bishop. Aided by software simulations, the above pictured 3D model was the result of her detailed analysis – though it is still subject to various interpretations. As we can comprehend from the image, St. Nicholas was probably an olive-toned man past his prime years, but still maintaining an affable glow that is strikingly similar to the much later depicted Santa. His broken nose may have been the effect of the persecution of Christians under Diocletian’s rule during Nicholas’ early life. And interestingly enough, this facial scope is also pretty similar to the depictions of the saint in medieval Eastern Orthodox murals. While Santa is generally associated with the merriment of children, the ‘portfolio’ of St. Nicholas’ blessings spread to other avenues as well. This was especially true among sailors, given Nicholas’ initial livelihood probably being directly related to fishing. But the course of history 700 years after his death made him the patron saint of sailors. The scenario was spurred by the intermittent conflicts between the Seljuk Turks and the Byzantine Empire in 11th century AD. 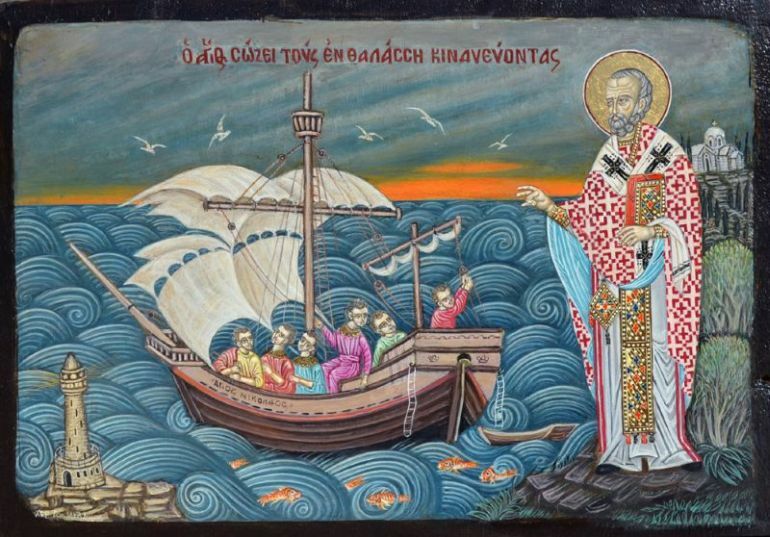 Concerned about these chaotic engagements in the region of Asia Minor, a group of Christian Italian sailors mounted a covert operation and snatched away the reliquary of St. Nicholas from Myra, and subsequently, his relics were taken to Bari (as mentioned before). Interestingly, in a ensuing quarrel among the group members, the Venetians also got hold of some of the saint’s remains. 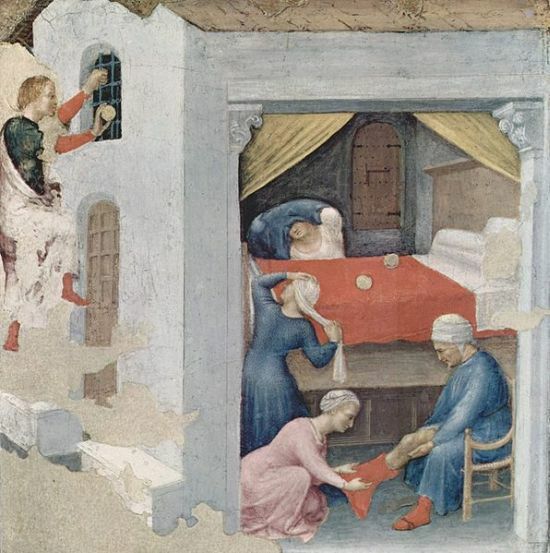 Subsequently, the ‘division’ of the relics led to the separate establishment of pilgrimage centers and churches in both north and south of Italy, thus paving the way for St. Nicholas to be the patron saint of sailors during medieval times in Europe. Furthermore, St. Nicholas is also considered the patron saint of merchants, grooms, haberdashers, judges, longshoremen, archers, brewers, pawnbrokers and even thieves who have later repented.